Welcome! Veazie Veterinary Clinic wants to be the best possible primary care provider to pets and their families in the Bangor area and throughout Maine. We promote an environment of animal health & well being with people who share common values. We are ever mindful of the human/animal bond and our responsibilities to our community, our environment and ourselves. Our staff is an amazing group of people. Each one is dedicated to treating both you and your pet with care and compassion. Each brings their own skills, interests and special touch to the team. Many of us feel as though our co-workers are a part of our extended family, and we support and encourage each other both at and outside of work. We all live in and around Bangor and love this area of Maine. 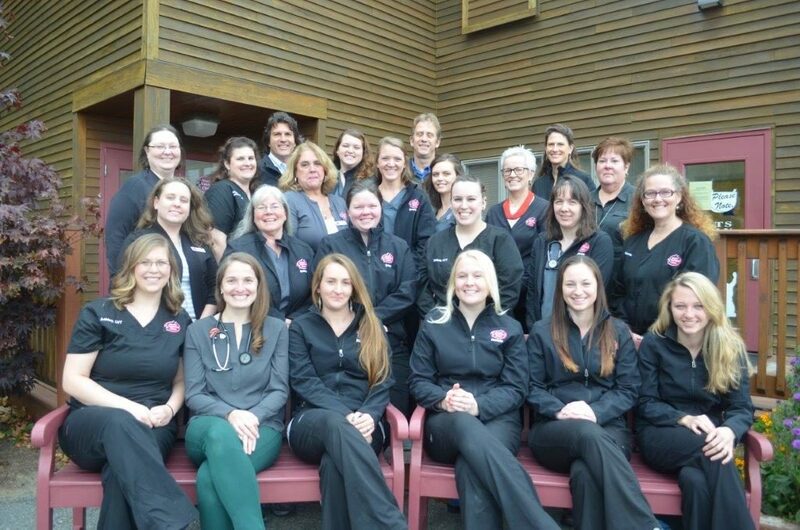 On this page we are sharing a bit about Veazie Veterinary Clinic, our backgrounds, what we bring to the practice and what we enjoy outside of work! We will listen to our clients and be respectful and supportive of them and the sometimes difficult decisions they have to make. With patience and gentleness, we will tailor our medically progressive knowledge and skills to meet the individual needs of our clients and their pets. We have chosen to come together as a group of passionate professionals dedicated to fostering an environment of continual learning and self-development that embraces diversity. Life is short and calls to be explored, experienced, and enjoyed to the fullest. Maintaining a positive fun-loving work environment benefits our patients, our clients and those with whom we work. Time invested in our life’s work is considerable. It demands our full attention and our best selves. This requires that we respect our own and each others’ personal time away from business responsibilities as well as the ability to respond to life’s circumstances as we work. We have set high, yet attainable, goals and realize obstacles and stumbling are inevitable. With this awareness, we can diminish frustration and judgement as challenges arise. A commitment to personal growth and understanding is paramount to self-responsibility.